Shipping is a staple of any online transaction, and we strive to ship our products in the most efficient way possible, usually within 24 hours of your order being placed, except for Sundays and Holidays when the Post Office is normally closed. Please make exceptions for unexpected emergencies and inclement weather. We work very hard to package your treasures to ensure they will arrive safely at your destination, just as they are shown in the listing. We will not scrimp on packaging materials, as that would not benefit you, the customer, or us. 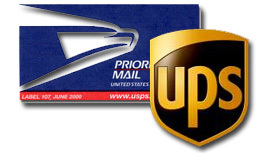 We ship via the United States Post Office and United Parcel Service. We reserve the right to determine which service would best deliver the product to you most affordably without compromising the integrity of the product being shipped. If either service is not available to you in your area, please let us know before purchasing so that we can be sure to make adjustments if need be. Most payment services require that shipments be sent to a confirmed address. It is the customers responsibility to ensure that their shipping address is updated and correct before placing an order. We will gladly agree to ship to another address on a case by case basis, especially if you are purchasing a gift for someone else. PayPal offers the option to add numerous addresses into your account and you would only have to choose that address when completing your transaction on the PayPal website. More on payment services will be covered on our Payments page. A Word on International Shipping. We are always happy to combine shipping for your purchases made at the same time. For items that are over 13 ounces, we used Calculated shipping which sets the price by combined weight of all items set up in the same fashion. This happens automatically. However, there is no way the system can combine fixed rate shipping with calculated shipping. If you have a special request or concern about shipping numerous items, please contact us beforehand and we will set up a customer order which will show one price for shipping all items. Please include URL Links (from your browser bar) so that we can accurately identify and capture the listings you are interested in. Otherwise, shipping will process normally as it is set up to do so within it's capabilities. Please note, Large Bulky and Fragile items can not ship with other items in most cases. Please contact us first if you want to combine anything with a larger fragile item. It is in both our interests to insure that your purchase arrives safely at your destination. The retail industry has used the term "Free Shipping" rather loosely as a way to give the impression that the customer will not be charged a shipping fee over and above the price point for their purchase. Shipping is not free, no matter how it is stated. Someone has to pay the shipping company for transporting the packages to your destination. The industry, however refuses to accurately label the practice as "Shipping Included". And this is what is done. The shipping and overhead fee's are figured into the price point and passed on to the customer so that one all inclusive price point is shown....leading the customer to believe that shipping is paid for by the retailer. The retail Industry refuses to use the term Shipping Included, but we want you to know that this practice is deceptive, and if we could over-ride and change it, we would. Please know that any item listed in this store with Free Shipping, simply means that shipping has been included in the price point. No additional shipping fee will be added at checkout for items sold in the USA that offer Free Shipping.